Every time Bad Company comes to the region, yours truly has to be there. Bad Company’s 2010 and 2016 gigs at the Joint inside the Tulsa Hard Rock were nothing short of magnificent, and lead singer Paul Rodgers’ solo shows at the same venue in 2012 and 2014 also carried undeniable aural magic. The songs, the sound mix and, last but never least, the musicianship and vocal efforts of a Bad Company concert deliver again and again. A few moments after 8 p.m., the venue’s house lights dimmed and large puffs of white-colored dry ice hugged the rectangular-shaped stage. 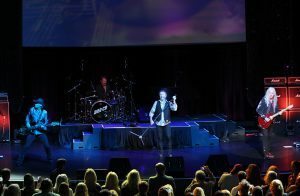 Rodgers emerged first at the piano for the haunting chords of the songs “Bad Company.” A few moments later, drummer Simon Kirke, guitarist Howard Leese and bassist Todd Ronning assumed their respective spots under the dark-blue stage lights. A member of Paul Rodgers’ solo band for a few years, Ronnig has slipped into the bass-playing role in Bad Company nicely. Ronning always has been impressive. 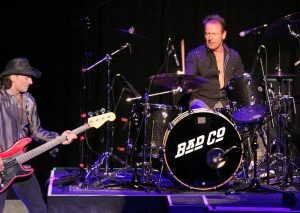 In 2012, the cowboy hat-wearing Ronning was more than capable of handling the bass lines of Bad Company and Free; Free was the pre-Bad Company band with Rodgers, Kirke, bassist Andy Fraser and guitarist Paul Kossoff. For the recent Bad Company performance in Tulsa, Ronning’s left hand commanded the neck of his bass with ease. For the sweeping “Run with the Pack,” Ronning’s hands moved smoothly over his bass strings, doubling alongside Rodgers’s assertive piano lines to help build tension as the song coasted beyond the 4-minute mark. Kirke and Leese, a former guitarist with Heart, also proved to be magnificent during Bad Company’s set. Utilizing what looked to be a 4-piece drum set, Kirke was absolute sonic thunder, giving his snare drum, cymbals and both high-hats a true work-out. Kirke’s playing is the best of both rock-and-roll worlds. When the music calls for it, Kirke is a hard-hitter, but he’s a clever musician. He never loses grip of his finesse. Leese also is a more-than-reliable compatriot in the Bad Company camp. Like his three band mates, Leese played with authority. His solos and thick-sounding rhythm work were muscular enough that they negated the need for a rhythm guitarist. Leese, just for fun, even threw in the guitar lick to Heart’s “Barracuda” in place of one of his guitar breaks, which planted smiles on several fans inside the venue. Right from the get-go, Bad Company sounded extremely confident and remarkably air-tight. When Rodgers isn’t playing piano or 12-string acoustic guitar, Bad Company essentially is a three-piece group, instrumentally speaking. The Tulsa event was the first of only four Bad Company shows that are sprinkled out between now and the end of April, yet there were no signs of first-night jitters or lack-of-practice rust. How Bad Company possessed such a full, wide, energized sound during that 90-minute appearance still remains a head-scratching mystery.